There's a very small village named Tivre [तिवरे in local language] in the Konkan area of the Maharashtra state in India. One of my friends was born there. I have been there 2 times. What a beauty that place has! In the early monsoon of 2006, during my first visit there, I was amazed to see a fallen tree very unreasonably lying at a place. I have no idea how it reached there. Probably, from the forest, it fell down in a river, and reached here with the flow of the river. The above photograph was taken sitting on a small dam's wall, facing towards the backwaters. 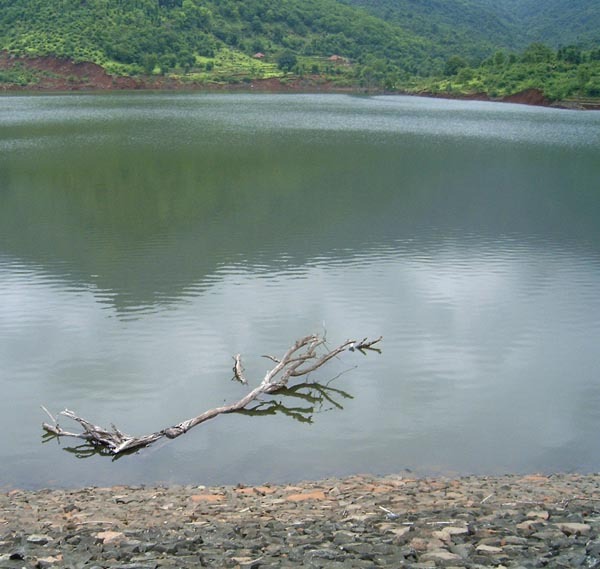 The dam is built on a river named Vashishti passing through Tivre, probably originating from the dense forests of Koyna in Konkan. To give you an idea where the photo was taken, I have given its location in a map below. If you zoom out, you will find out how beautiful the location of the village is. Thanks for passing by my blog, then I could discover your magnificent region! Beautiful blog. Thanks for stopping by the pictures are great but I still like the splatt tree I just can not imagine it being strong that is still no You have amazing photos . The tree branch looks beautiful and mysterious. Enjoyed the aerial photo map of the gorgeous place. Thanks for stopping by my blog - glad you liked the photos. I did Part One in a post on 20 August which you may like to have a look at though there's much less countryside! I'm planning to do a follow-up on Seville, Cordoba & Granada which are all really outstanding! So pleased I've come across your site - the photos above are stunning, especially the tree branch! So solitary & ethereal! PS Am yr newest follower! Bhavesh! What a lovely place to visit! Looks beautiful! Beautiful body of water and the surrounding green landscape. Your theory sounds right. The tree must have come down a river, since there don't seem to be trees surrounding the lake. Tivre is like a jewel in its beautiful setting! How very odd that that driftwood tree ended up in the dam's reservoir. The power of nature! Wow! What a wonderful place and great photos! I am glad I visit your blog. Thanks for your nice comment on Leaves of Grass. I just scrolling the last photograph and it's amazing indeed! Thanks for told me that. it looks so elegantly lonely! A truly magnificent place and that tree adds charm and beauty. Beautiful photo of a silent world. Congratulations. Excellent! the picture and what you described in words, and thanks for the location map. Another interesting post from you. I loved reading your thoughts on these great pictures. I am always so pleased when you take time to pay me a visit and leave a comment. My doctor is from India so when you share part of your world with us, I realy pay attention. If you have time come again by again next Tuesday, 9-1.
ooooo Bhavesh! Beautiful! Thanks for adding the map too, what a great idea! I find this post really worth reading, keep up the good job! Thanks for sharing such awesome post with us, keep up the good job!